Our last blog was on the Real Estate Board of Greater Vancouver's residential statistics for Vancouver East. Today, we'll be looking at Vancouver West. As you can see, year over year, the three property types have seen a decrease in unit sales. 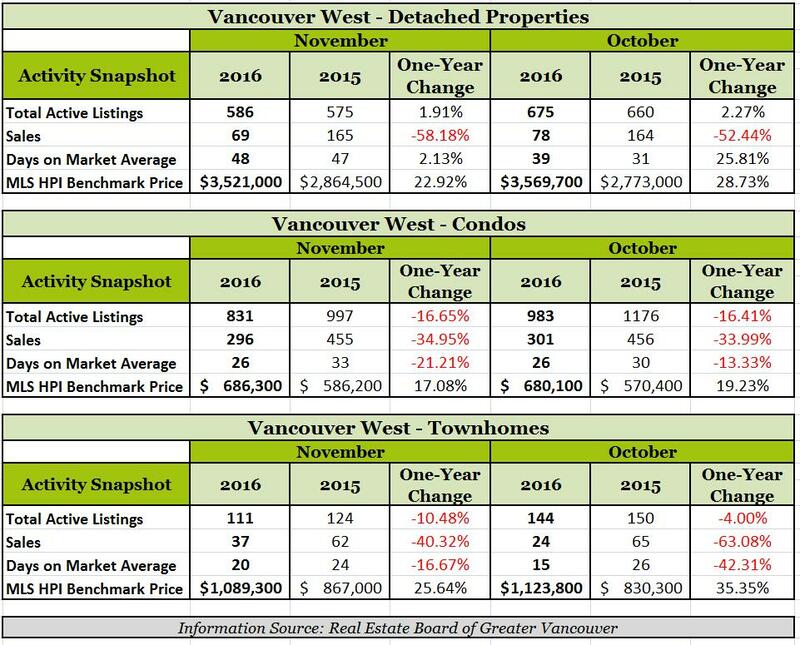 However, if we were to compare on a monthly basis, from October 2016 to November 2016, there has been a decrease in sales for detached properties and condos of 11.54% and 1.66%, respectively, and an increase of 54.17% for townhomes. As for the MLS HPI Benchmark Price, there has been an increase across the board when comparing between 2015 and 2016 in the months of October and November, which is a similar trend for Vancouver East. When comparing October 2016 figures with November 2016 figures, there are mixed results. There was a 1.36% decrease for detached properties, 0.91% increase for condominiums and a 3.07% decrease for townhomes. For a look at the MLS HPI Benchmark Price over a 10-year span, click here. For all your real estate needs, contact the WeSellVancouver team at info@wesellvancouver.ca or alternatively at 604-801-6654. Don't let the stress of managing your rental property consume you! Let our property management division do all the heavy lifting for you while you reap the benefits. Whether you are an off-shore owner with a luxury fully furnished waterfront condo or a local owner with a single or multi-unit investment property, the team at WeRentVancouver can help. With many years of experience, our licensed property managers strive to make your investment as profitable as possible by offering a full range of property management services that meet your every need. We understand your time is valuable and so our goal is to simply do the leg work for you, allowing you to make maximum profit from your investments, hassle-free. Let your property go to work for you, contact us today at 604-801-6654 or at info@werentvancouver.ca. For more information about how we can help you make the most of your rental property, check out our website at werentvancouver.ca - we look forward to hearing from you!